Rhubarb - which is actually a vegetable, not a fruit - is served as a compote in Denmark with chicken, pork or fried fish. 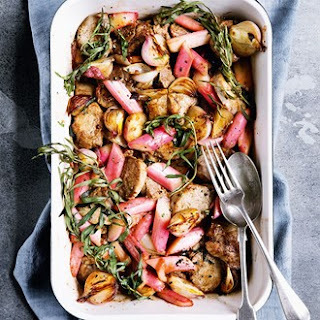 Here the tart rhubarb is a perfect match for the sweet-tasting pork. The crushed peppercorns give it a spark of spiciness, but you can use less if you prefer. 1.Heat the oven to 200°C/fan oven 180°C/mark 6. Cut the tenderloins into 12 small steaks and sear in a hot frying pan for 1-2 minutes on each side, then lay in an ovenproof dish and sprinkle with salt. Set aside. Using the same frying pan, melt the butter and add the shallots, frying until lightly coloured. Add the rhubarb, sugar and pepper, stirring well. Turn off the heat and add the tarragon. Stir before pouring the mixture over the pork. 2.Cover the pork dish with foil and roast for 10 minutes. Remove the foil and roast for another 2 minutes.